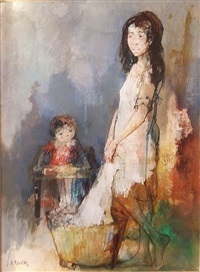 Jansem, a recognized French Armenian painter, was born Hovhannes Semerdjian on March 9, 1920, in Sölöz, a village near Brusa, nowadays Bursa, in northwestern Asia Minor (Turkey), which was also the birthplace of the famous writer Hagop Oshagan. The Semerdjian family fled in 1922 to escape the massacre and deportation of Greeks and Armenians undertaken by the Kemalist movement in Asia Minor. They settled in Salonica (Greece), where Hovhannes spent his early childhood. After the death of his father, he moved to France with his mother in 1931. They settled in the suburban town of Issy-les-Moulineaux, one of the traditional concentrations of Armenians around Paris. He broke the bones of his foot in an accident and had to spend three years in the hospital. From 1934-1936 he attended a variety of evening classes in Montparnasse and the Marais, in Paris. He met painter and teacher Ariel Ajemian, who taught him to draw, but he found his grand revelation in the works of Picasso. He was admitted to the École des Arts Decoratifs (1936-1938), and completed a training course at the École des Beaux-Arts and at Atelier Sabatier in 1937. He adopted the pseudonym Jansem (from Jean Semerdjian) in his first exhibition in 1940 at the Salon des Independents. He would also be known as Jean Jansem. His paintings, which had been characterized by somber tonalities, took a new shape after his travel to Greece in 1950, when he discovered light. He eagerly sketched the shadowy figures of the Greek countryside that had surrounded him in his childhood and remained hidden in his subconscious. The yellow-green palette of his paintings was often associated to red, purely green, and orange tonalities. Critics defined him as a miserabliste, an artist of unfortunate people. In the 1950s Jansem won many awards in France and Mexico, and was decorated with the Order of the Arts and Letters of France in 1953. For the next half a century, he would have exhibitions in Paris, New York, Chicago, London, Tokyo, Rome, Brussels, Lausanne, Beirut, and other cities, and many of his works were acquired by European and American museums and private collections. He had the exceptional privilege of having two museums dedicated to his work in Japan during his lifetime (1993 and 1997). 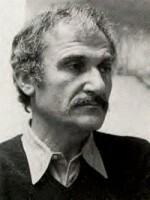 He visited Armenia in 1973 and again in 2001, when he donated his series of 34 paintings, “Genocide,” to the Armenian Genocide Museum-Institute. He was decorated with the Mesrob Mashdots award and received an emeritus doctorate from the National Academy of Sciences of Armenia in 2002. In 2003 he was ordained a Knight of the French Legion of Honor. Jansem passed away on August 27, 2013, at age 93, in Saint-Aignan-sur-Cher, in central France. The Treaty of Brest-Litovsk, signed between Soviet Russia and the Central Powers, marked Russian defeat and the end of her participation in World War I. The Entente (Great Britain, France, United States, and Italy) rejected the decree and Soviet Russia went forward to sign a separate peace with the Central Powers. The negotiations started in Brest-Litosvk on December 9, with the participation of Russia, Germany, Austria-Hungary, Bulgaria, and the Ottoman Empire. The Soviet delegation, headed by Adolph Joffe, brought as conditions the evacuation of troops from occupied territories, freedom to nations enslaved during the war, relinquishing to all war compensations and penalties, et cetera. The German delegation countered with its own plan, which included the annexation of the Baltic region to Germany and the division of Poland. Germany, besides, wanted to keep the Russian occupied regions in order to exploit their resources. The Allies did not agree to negotiate peace, and Soviet Russia started separate negotiations with Germany on December 27. One month later, the Central Powers came to an agreement with the Central Rada (the all-Ukrainian revolutionary parliament) to obtain food from Ukraine in exchange for military aid. On the same night, Germany submitted an ultimatum to Russia to comply with German conditions, which entailed to take the German border to Narva, Pskov, and Dvinya. The next day, Lev Trotsky, who had taken over the Soviet delegation, answered that Russia would not sign the agreement, ceased the hostilities, and evacuated its troops. The Central Powers went on the offensive on February 18 in the entire Eastern front. The Russian armies could not resist and consented to an agreement on February 19. However, the Germans continued their offense and only stopped on February 22, dictating even harsher conditions. The Central Committee of the Communist Party agreed to the signature of a peace treaty. The Treaty of Brest-Litosvk was signed on March 3, 1918. The harsh conditions of the treaty were humiliating. Russia lost the Baltic lands and part of Belorussia; Ukraine and Finland were declared autonomous republics, with the subsequent evacuation of the Red Army. More importantly, it also ceded to the Ottoman Empire the regions of Kars and Ardahan, which were Armenian territories, and Batum (Georgian territory) in the Caucasus. It is important to remember that, after the October Revolution and the retreat of the Russian troops, Turkey had gone on the offense and reoccupied the territories of Western Armenia lost to Russia in 1916, later invading the Caucasus. Interestingly, Russia no longer had effective presence in the region, and maintained a purely nominal attachment after the revolution. The end of the hostilities allowed Germany to concentrate its forces on the southern front and start an offense from March 21 to June 17, 1918, but this was unsuccessful, as the Allied forces countered with a tactic of continuous attacks that finally ended in German defeat. It is important to note that the Bolsheviks were not the legal and recognized authority of Russia in 1918, and therefore had no legal right to sign a treaty on behalf of the country. However, this signature allowed the Bolshevik government to keep the power and dismiss their opponents, particularly the Socialist Revolutionaries. In the end, this would also become a motive for the beginning of the bloody civil war in Russia that would last four years. A supplementary agreement signed in Berlin on August 27 established the payment of six billion German marks by Russia to Germany as war compensation. However, the Treaty of Brest Litovsk was declared null and void by Russia on September 20 and after the end of the war, by Turkey on October 30, and by Germany on November 13.